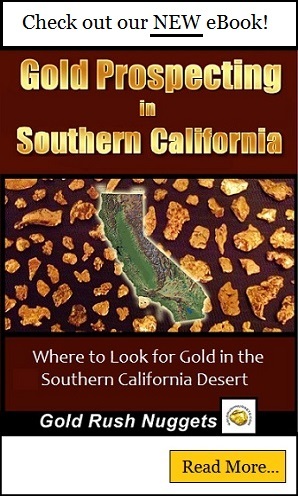 The San Gabriel River is a very popular gold prospecting destination in Southern California. Located a relatively short distance from Los Angeles, it provides a great opportunity for folks who want to get out of the city and search for a bit of gold. This area was a major gold producer as early as the 1840’s, when placer gold was found in the San Gabriel Mountain Range. It didn’t take long before prospectors were all over this area in search of gold. The production record for this area show that several million dollars of gold came from this area during the first few decades of mining, but these records are known to be inaccurate and actual production is likely much higher. Miners originally placer mined the San Gabriel River by hand, and worked into many of the smaller streams and rivers. Soon after the initial discoveries here, gold was being mined by at many lode and hydraulic operations as well. The East Fork of the San Gabriel is known to be the richest area to explore here, although gold can be found in many small creeks and gulches throughout the San Gabriel Mountains. The area is generally not considered to be as rich as the famous Mother Lode area to the north, but it is still a reliable producer of gold for a hard working prospector. There have been large gold nuggets found which can be located using a quality metal detector, but the majority of gold found in this area are going to be smaller fines and flakes. There is also the occasional gold in quartz specimen still found here, and some of them can be true museum quality specimens. Simple equipment such as gold pans and sluice boxes are still reliable producers of placer gold. Keep in mind that California currently has a ban on suction dredging, so this is no longer an option for prospectors. Despite the frustration of this current rule, there are still several decent methods that can be used to find gold, so don’t give up! Generally the most productive area to prospect is the same areas that the old timers worked during the 1800’s. Because of their crude mining methods, they often missed a large percentage of the gold that they ran through their sluice boxes and rockers, meaning that much of the gold is still in the ground waiting to be found. Don’t overlook old tailing piles of waste rock. There have been many nice nuggets and specimens found in the waste piles that were pitched aside by the early miners. Due its nearby vicinity to the hugely populated areas of Southern California, the area gets a lot of pressure from recreational prospectors as well as campers, picnickers, and fisherman. If you visit, be sure to respect the area by picking up your trash and leaving the area better than when you got there. There is no reason that gold prospecting can’t go right along with other recreational pursuits. There have been increasing reports of harassment by Forest Service officials against prospectors along the San Gabriel River, but it is my understanding that these cases are generally for homeless campers who are trashing the area and overstaying the designated camping limits on public lands. Treat the area with respect and hopefully you will have no difficulties. Mining is your right, but with all of the recreational conflicts on public lands these days, it is always best to go above and beyond to represent miners in a good light.